Our relays boys who are in Thailand currently competing in the Asian Grand Prix is in superb fine form. This was evident as the quartet of Calvin Kang, Gary Yeo, Lee Cheng Wei and Amirudin Jamal, in that order, ran a sublime timing of 39.83 seconds in the men 4×100 metres event, during the first of three legs held in Bangkok today. They are just 1-hundredth of a second away from equaling their relays national record of 39.82 seconds (Established in 2009 Vientiane, Laos, SEA Games). Team Singapore finished fourth behind Asian powerhouse of Hong Kong (39.28s), China (39.48s) and India (39.51s), but savored victory as we finished ahead of our SEA perennial opponents Thailand who was fifth in 40.21s and Indonesia who finished last in 40.29s. South Korea was disqualified. 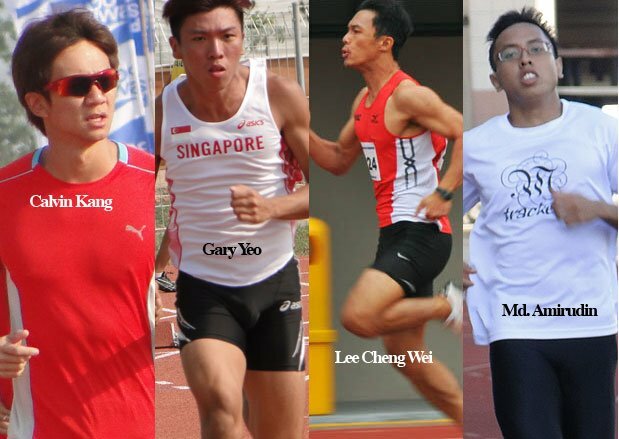 Other Team Singapore results includes, 2011 SEA Games 100m silver medalist, Gary Yeo clocking 10.89 seconds in his Group A race, ranked 11th out of a total 16th runners. While Lim Yao Peng ran 11.02 seconds in his Group B 100m race. He was ranked 16th out of 16 places. The next leg would be Kanchanaburi (11 May).